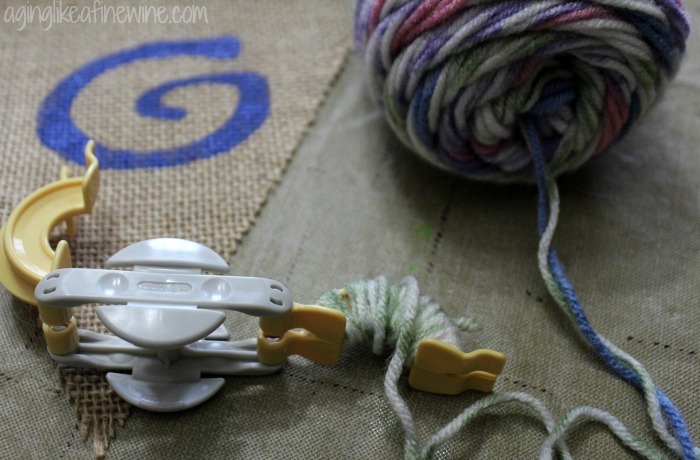 Each month a group of bloggers responds to the call to create something for the DIY Blog Challenge. 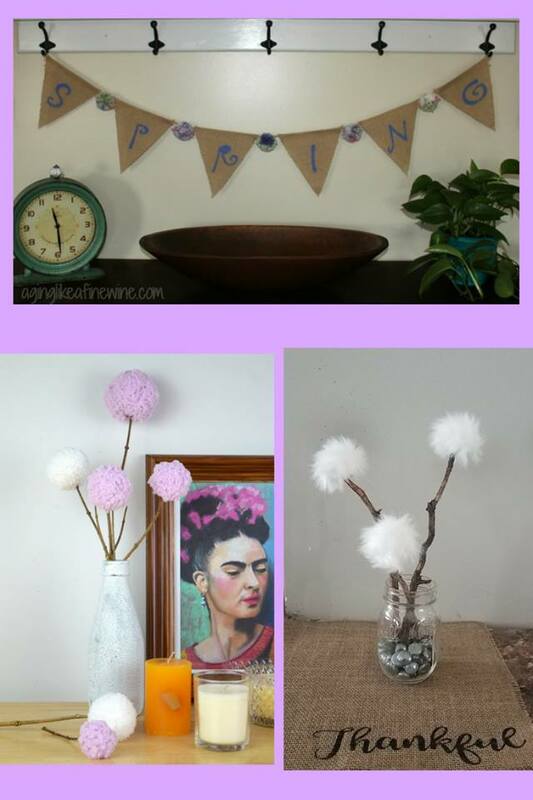 Our challenge this month was to create a project with pom poms. I had never made a pom pom in my life, so my first step was to buy a pom pom maker. I found out that making pom poms is actually fun so I’ll probably be looking for ways to incorporate them into other projects! Maybe you’re a neat painter, but I’m not so I always cover my work area with an old vinyl tablecloth. 2. 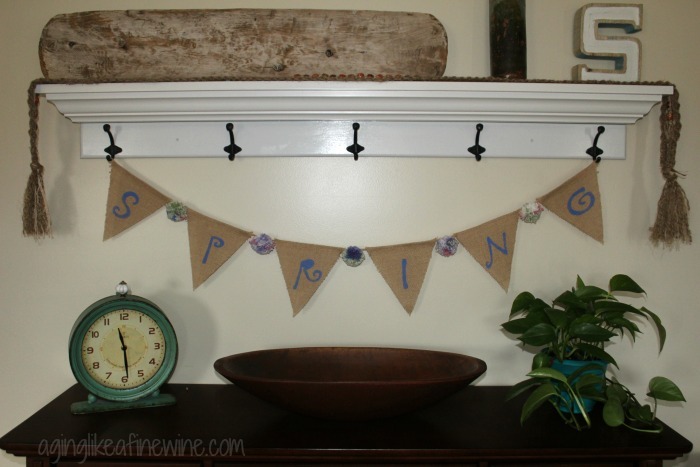 Lay your garland out flat on the table. 3. Position the first letter on the burlap. 4. 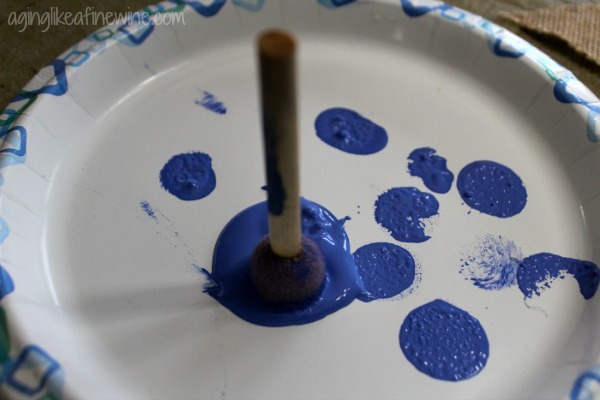 Pour out some paint onto a paper plate. 5. Dip your sponge into the paint and dab off excess. 6. 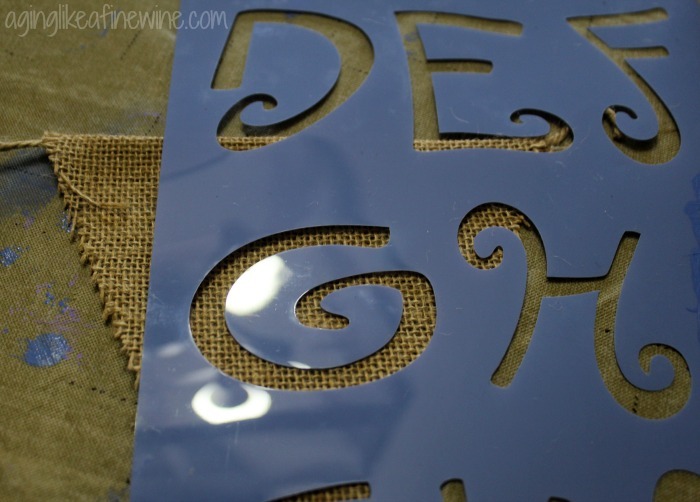 Holding the stencil secure, dab the paint onto the burlap through the stencil. 7. Lift the stencil off and go on to the next letter. 8. 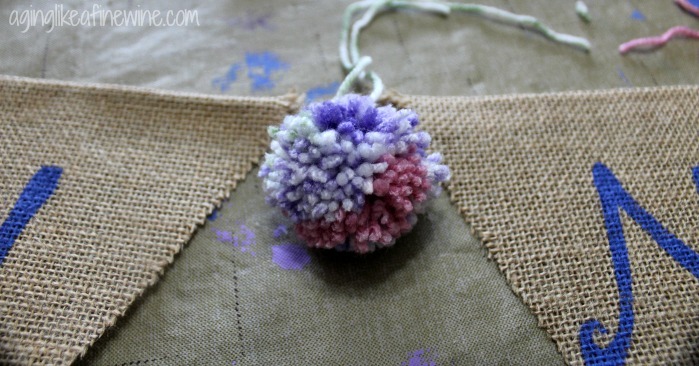 Following the instructions for the pom pom maker, make as many pom poms as you plan on using. 9. Tie one pom pom on the cord between each of the triangular pennants. My garland only had maybe 1 1/2 inches of cord on each side of the pendant. I wanted to hang it from a hook so I formed a small circle with the cord on each side and used my hot glue gun to secure it to make it easy to hang up. I’m so happy with the way it turned out. I think it’s a welcome addition to this wall in my living room. It was also very, very easy. 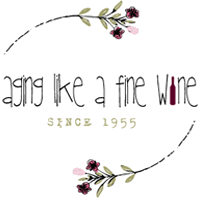 Be sure and visit each of them and check out their creations! Thank you for stopping by today. 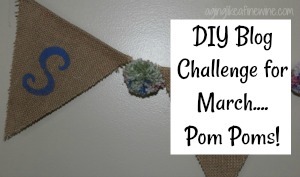 If you’ve never made pom poms before I hope you are now inspired to give it a try! 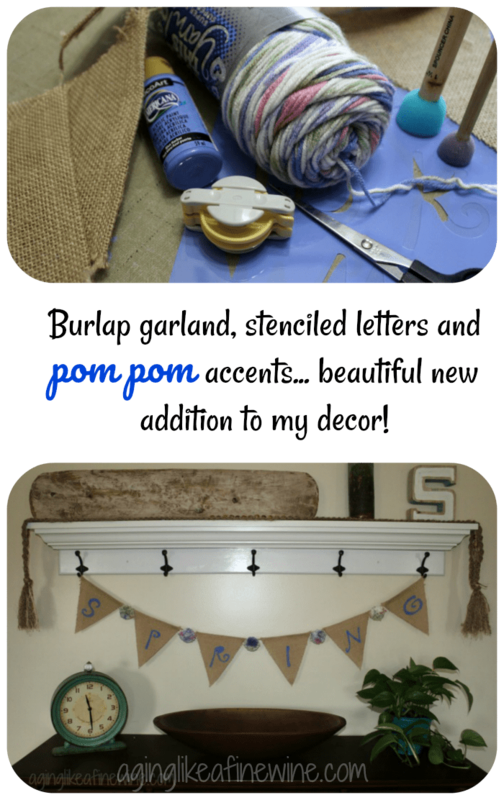 If you have made pom poms, what was your favorite project? My favorite project with the DIY Challenge was this wreath for Halloween! This post will be shared on link parties found on my “Where I Party” page. This is so cute! 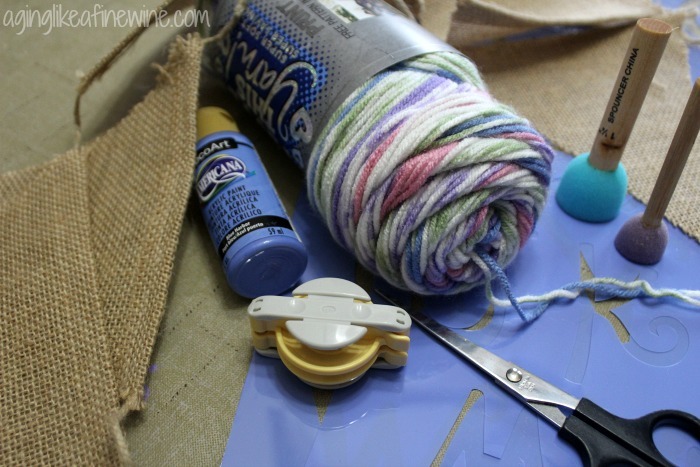 I love burlap projects and really love the idea of burlap and pom poms together! Such a great idea! Thank you Cassie! Don’t you love it when a project turns out the way you hoped! Totally adorable! And I love the colors you chose. Thank you Nikki! I love it when a project turns out good! Thank you, Sue! It was so easy and I’m happy with it. Don’t you just love it when a project turns out! Have a wonderful week. Thank you so much Marily! It is such an honor to me to be featured and I truly appreciate it!